← Plumb Beach Planting and Paddling Fun! HarborLAB paddling the dock east on the main channel of Newtown Creek. Note the bright green kayaks at the HarborLAB GreenLaunch at the apparent base of the Empire State Building. Photo by Mitch Waxman. 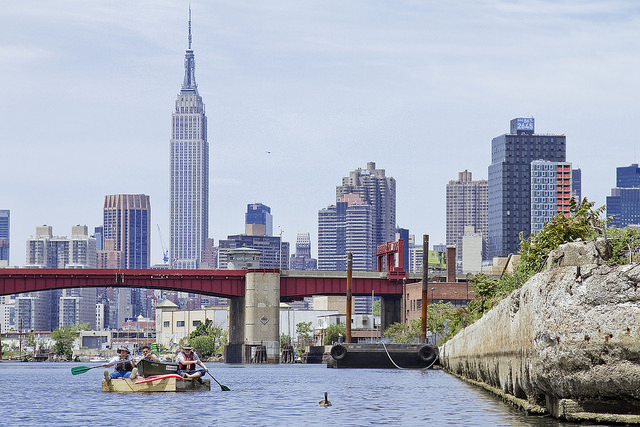 Participants in the coming 13 Steps Around Dutch Kills tour by Mitch Waxan will find something new on this forgotten waterway, which terminates just south of the LaGuardia Community College campus of the City University of New York — a new science research dock! As an environmental science education and service organization, HarborLAB does much more then produce recreational paddles. One of our recent projects was to build a dock for the CUNY LaGuardia Community College Environmental Science Program to use on Dutch Kills, a branch of the Newtown Creek. The college has become a center for independent research and community information on the creek, including innovative work for habitat restoration. But these important efforts, which afford students unique opportunities to address an EPA Superfund Site, were hindered without the safe water access and stable platform of a dock. HarborLAB paddling the dock north on the Dutch Kills branch of the Newtown Creek. Photo by Manny Steier. HarborLAB itself needs a dock and we knew we could save the college time and money through our labors, so we set about learning to build them by rebuilding a rotted dock from the Stony Brook Yacht Club, which also kindly donated flotation billets. 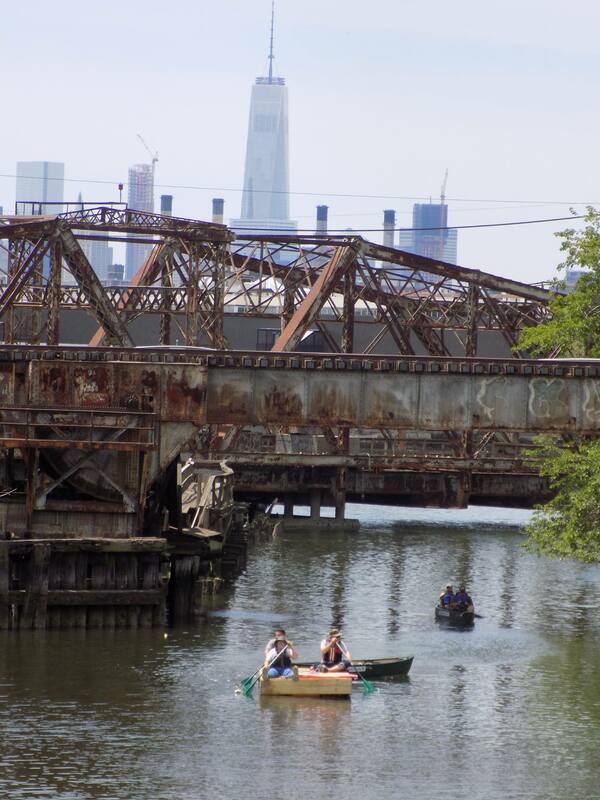 Mitch Waxman, official historian of the Newtown Creek Alliance and Newtown Pentacle author, photographed our human-powered dock delivery from a canoe while HarborLAB volunteer Manny Steier captured the event by biking from bridge to bridge. We’ll complete our own dock in the coming weeks and welcome your help! In the meantime, see some of the good our hard work has produced by joining Mitch and the Newtown Creek Alliance on the 13 Steps walk! A gallery of Mitch Waxman’s photo of the dock delivery. A gallery of Manny Steier’s photos of the dock delivery.